Newly Renovated for your stay! All guest rooms on the third floor and several guest rooms on the second floor of The Main Inn have received a fresh new look. 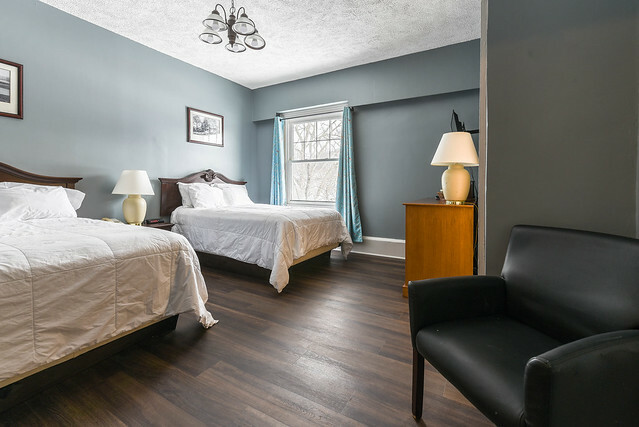 Each renovated guest room now features beautiful hardwood flooring, walls with a fresh coat of relaxing, country-inspired paint, and fresh, new drapery to inspire a calming, cozy setting and experience unlike any other in the Poconos. Each guest room boasts the comforts of home in an old-world setting. Relax with beautiful views of the property and surrounding landscape. Each guest room has heating and air conditioning, making a comfortable environment no matter the time of year. The Shawnee Inn’s handcrafted soaps and shampoos are available complimentary. An iron and ironing board are available in each guest room for crips, wrinkle-free attire. Enjoy DirecTV® through the flat-screen television in each bedroom—videos-on-demand are also available. Each room also features a mini-fridge. All guests at in the Main Inn will have access to complimentary WiFi, bell service, and the onsite business center. Take a dip in the indoor pool and enjoy a day in the spa. Don’t miss out on your exercise routine with the fitness center. *Some guest rooms feature hardwood flooring. To view recently renovated rooms and areas in The Shawnee Inn and Golf Resort click on the Flickr Album below.